Pasta is a traditional Italian food staple that’s captured hearts and bellies all over the world. Made very simply from durum wheat flour, water and sometimes eggs, it’s also one of the most versatile and cheapest foods around. According to estimations, there are about 350 different types of Italian pasta including all-time favourites such as spaghetti, tagliatelle, fusilli and ravioli. For convenience, we mostly buy dried pasta, though fresh pasta is also readily available from the chiller section of your supermarket. Of course, if you want the authentic taste, there’s nothing like making fresh Italian pasta yourself. The big question is: how long does pasta keep? In terms of storage and shelf life, there’s a huge difference between fresh and dried pasta. Fresh pasta must be kept in the fridge. Whether you make your own pasta or open a shop bought packet, put any unused pasta in an airtight container and use up within a few days. The only way to extend the shelf life of fresh pasta is by storing it in the freezer. Dry pasta, on the other hand, will keep longer than most other items in your pantry as long as you store it properly. Before use, keep the product in its original packaging and put it with the other dry foods in your kitchen cupboard. 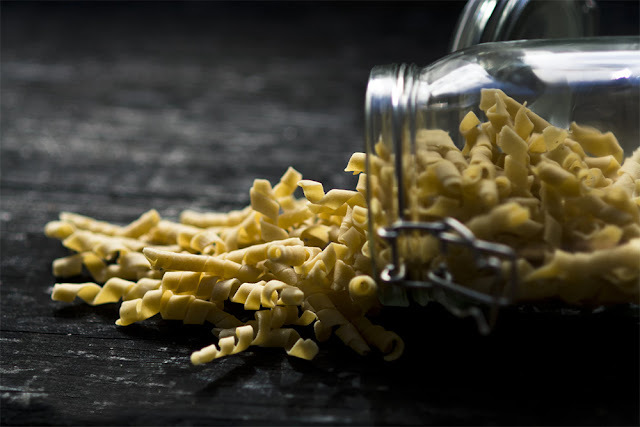 Moisture is the enemy of dried pasta – it will go mouldy within a few days. Once the packet has been opened, it can still be kept in the cupboard – many types of Italian pasta packaging (like these at the Bag Broker) have a resealing tab to keep the freshness in. Otherwise, it might be better to transfer the contents to an airtight container for longer term storage. All food products have a ‘best before’, ‘use by’ or ‘sell by’ date, and pasta is no different. This is an indication of how long the manufacturer expects the product to be fit for use and will vouch for its safety. In the case of dried pasta, it’s usually just a rough estimate of the product’s shelf life. The date on the packet will err on the side of caution and under normal circumstances, the shelf life of dried pasta is very long. With proper storage it can literally last a couple of years past its official expiry date. That said, the shelf life of pasta will depend on how it was made, whether it has any preservatives added and the amount of moisture retained after the drying process. Fresh pasta is a different case altogether. Here, the date should be an accurate estimate of the real shelf life. Keep unopened packets of fresh pasta for a week or so and, once open, consume the contents within 2-4 days. Home made fresh pasta should be eaten up within 2-3 days, since no preservatives will have been added. If you want to keep fresh pasta for longer, you can keep it in the freezer for a month or two. It will still be OK to eat if you freeze it for longer, but the taste won’t be as good as when it’s fresh. Finally, cooked pasta or a leftover pasta dish that you’ve prepared at home should be treated like any cooked dish. For food safety reasons, store any leftovers in the fridge and consume within 3 days, especially if your dish contains meat or fish, or put in the freezer once cooled to room temperature. Has my pasta gone off? Food hygiene and safety are essential in protecting us from foodborne illness, and it’s always a good idea to use your senses to tell you if anything is wrong with the food you’re thinking of eating, regardless of ‘best before’ dates. Fresh pasta ‘gone bad’ should be easy to spot. Look out for noticeable signs of discoloration or mould, a dull or slimy appearance or an unusual or unpleasant smell, and throw the pasta away if you find anything odd. Dried pasta is unlikely to ‘go off’ in the same way as fresh pasta does, unless it is exposed to moisture. However, it does lose its taste over time, so if you have 2-year old spaghetti in the cupboard, you may wish to taste it first before committing to a full recipe. A rare problem with long-term pasta storage – or indeed other dry cupboard staples like rice, flour or lentils - is weevil or bug infestation. It’s a disconcerting thought and highly unlikely to occur, but if you’re using pasta that’s been in the cupboard for an extended period of time, make sure you inspect the contents closely before use.